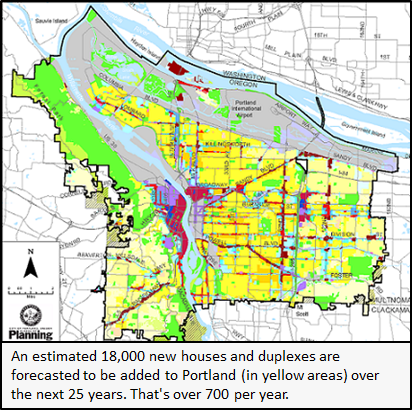 If you have been following the city’s process to update its Comprehensive Plan for how Portland will grow over the next couple of decades, you are probably keenly aware that much of this growth is directed toward mixed use zones situated along corridors and in centers. Portland is forecast to add about 120,000 new housing units over the next 25 years. If the city develops like it is laid out in the Comprehensive Plan, nearly 80% of these new homes will be in multifamily buildings. One of the results of directing future growth in this manner is that the proposed Comprehensive Plan leaves large portions of the city untouched in terms of zoning. For the most part, the yellow parts of the zoning map – the zones for single family homes and duplexes – will maintain their current zoning. Since the bulk of the forecasted growth is in mixed use areas, the implementation projects underway have been focused on development standards for commercial and mixed use areas. This has left many neighborhoods dealing with single-family infill without an outlet to address their concerns. These neighbors might soon get some relief. The Bureau of Planning and Sustainability is requesting funds from the “Spring BuMP” – the adjustment to this year’s budget to account for unanticipated revenues – and the fiscal year 2015/16 budget to tackle the development code that dictates how things are built in single-dwelling zones. If funded, this project could ultimately revamp the single dwelling development code. Two of the driving forces behind the Single-Dwelling Development Code project, as identified in the project’s description (pg. 32), are compatibility and affordability. Let’s look at both. One of the big issues I hear from some neighborhoods is that many of the new single family homes are being built are out of scale with what currently exists in the neighborhood. The textbook example is the 1,100 square foot single story bungalow, on a street with similar houses, that is demolished and replaced by a 3,000 square foot home that is much taller, takes up more of the property, and is more expensive than what it has replaced. The other textbook example is the modest single family home that is being demolished and replaced by multiple “skinny houses” that are narrower than the other houses on the street, and also may be more expensive. In both examples, the type of housing that is being built is being dictated by a number of things. Chief amongst them are market forces, consumer preferences, and regulations. To In terms of regulating housing sizes, the code project could look at how much of a lot can be covered by housing, the allowable heights in single dwelling zones, the minimum setbacks on a property, and the size of required outdoor area. How these various levers are adjusted could impact the scale and design of what ultimately is built – with market forces and consumer preferences still playing a significant role, of course. The same regulations can also impact the scale, design, and, perhaps, feasibility of skinny houses. The R2.5 zone is where many of the narrower homes are being built. The zone currently allows a minimum lot area of 1,600 square feet. It also requires that each lot be at least 36 feet wide, but with detached homes the lot width can sometimes be reduced to 25 feet wide. This can work in the context of some neighborhoods, which have existing housing on lots that are smaller, but in neighborhoods where lots are traditionally 50-feet in width or more, to some it can feel like a dramatic difference. Could there be a way to tweak the R2.5 zone to make it more context sensitive? Would there be a preference for two attached homes rather than two narrow homes with a small space in between? Additionally, some of the narrow houses that you see being built are on lots that are zoned R5 or R7 on the zoning map, but were originally platted as 25-feet wide lots in the early 1900’s. Portland has had a back-and-forth relationship with these “historic plats.” In 1981, the city amended the zoning code to conform to its first Comprehensive Plan. As part of this amendment, new housing development on 25-foot-wide lots was prohibited. This remained in effect until 1991, when the zoning code was revised again to allow for narrow development in part because narrow houses can be more affordable. Could we see another moratorium on 25-foot wide historic lots? The single-dwelling development project could look at that. What could this look like? Some ideas that have garnered attention come from Eli Spevak, who owns the Orange Spot housing development company. In a February blog post, he outlines a “Plank of Progressive Planning Ideas for Portland that won’t Piss off the Neighbors.” Among them, allowing existing homes to be converted to multiple units, allowing second homes to be built on the same lot as on older home, and making it easier to have accessory dwelling units (ADUs). All of these ideas would require changes to the residential development code and they all could be on the table in the coming months. Design, neighborhood compatibility, density, and affordability – these are all big and complicated topics. An update to the development code can’t possibly solve all the issues, but this should be a valuable opportunity for our community to have an open discussion about what we’d like to see on the 148,000 single-dwelling zoned lots in our city both today and in the future.